With the recent cold snap and snow (did you get any?) I thought it was probably a good time to run through my winter haircare saviours. Having (faux) blonde hair that is very damaged, my locks are never particularly luscious, even at the best of times, let alone during the winter. Moving from my nice warm centrally-heated home to out in the crisp and cold air, and then back inside again, can't be doing my barnet much good. However, using a few helpful little products, I keep my hair frizz-free and looking a little bit healthier over the winter months. The conditioner - I think investing in a good conditioner is so important at this time of year. With shampoos I'm never really very choosy, but a good conditioner can really be the difference between good and bad hair during wintertime. At the minute I've been loving the PROVOKE Touch of Silver Intensive Conditioner* because it's ideal for blonde hair. 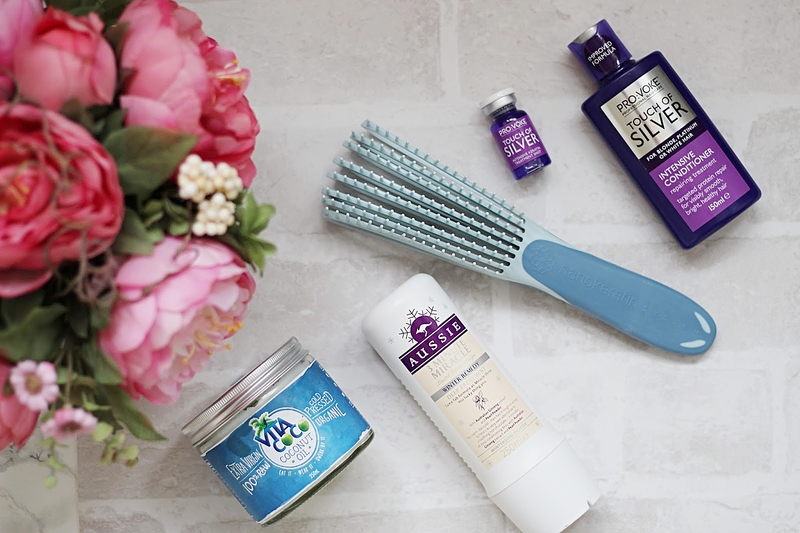 I sometimes think my hair can start to look a bit brassy after a while, so this purple conditioner helps to tone it down whilst giving my locks the intensive treatment they need. The deep conditioner - Whilst having a good, nourishing conditioner is crucial for daily use, I also think, particularly at this time of year, a weekly intensive conditioner is really important. You can work it in with your weekly pampering routine or time it for just before the weekend so your hair looks its best for your favourite two days of the week. My favourite deep treatment conditioner for the cooler months has got to be the Aussie 3 Minute Miracle Winter Remedy* because obviously it is specially formulated for this time of year and in my opinion Aussie have some of the best affordable deep conditioners you can get. They smell incredible and leave your hair looking and feeling so much softer, smoother and stronger. The intensive shot - If your damaged hair is in need of a big boost against the harsh wintry elements, I can't recommend PROVOKE's Touch of Silver Intensive Keratin Treatment Shots* enough. Available in a pack of three, these little babies help breathe life into lacklustre locks with a concentrated keratin formula that honestly makes your hair look and feel amazing after using. I tend to use one if I've got a big event coming up but I'd suggest using one a month over the winter period to keep your tresses in check. The oil - Obviously, a haircare post wouldn't be complete without mentioning the all-important oil. Whilst I love a liquid oil, I don't think you can beat Vita Coco Coconut Oil* - this uh-mazing multi-tasking oil smells incredible, leaves your hair feeling amazing and a little bit really goes a long way. You can even use it when cooking your meals! I love it and totally recommend it for year-round use, especially during the seasons when your hair needs a little extra love.